Great Glazing at Newark International Airport - Josloff Glass Co. The basics: Long spans of decorative glass serve as a standout element of the Terminal B Modernization at Newark International Airport. 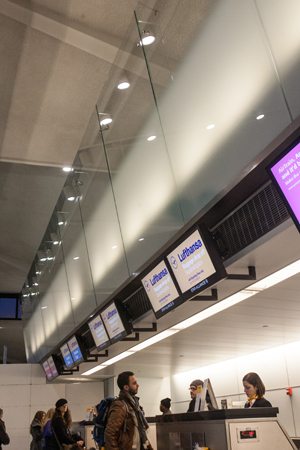 The international ticketing and departure halls feature about 17,000 square feet of oversized, digitally printed glass panels in a sloping screen wall, designed to provide aesthetic and privacy requirements for the space. 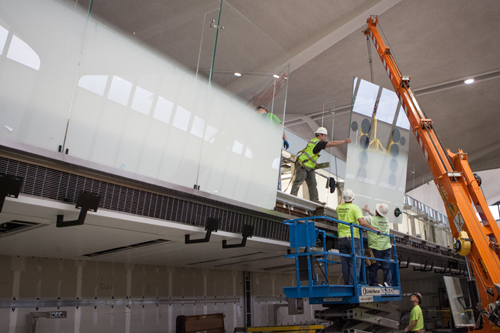 The project presented glaziers from Josloff Glass with notable challenges, as the airport remained operational throughout installation. According to Ian Josloff, president, the project team needed to remove portions of the exterior façade to gain access, in addition to using a mini crane to set the glass. The players: Architect, Voorsanger Architects; general contractor, VRH Construction Corp.; custom printed laminated glass supplier, GGI; decorative glass wall panels, Bendheim; glazing contractor, Josloff Glass Co. The glass and systems: The glass is oversized, tempered, low-iron laminated glass with Alice direct-to-glass printing. The glass—13/16 inch thick, with a 0.60-inch interlayer—features a complex printed white fade. “The printing challenge was to meet the different opacities on the same piece of glass for spandrel areas, privacy concerns, and overall aesthetics of the design,” says David Balik, GGI president. The largest lites were 96 inches by 212 inches, and weighed more than 1,200 pounds per lite. 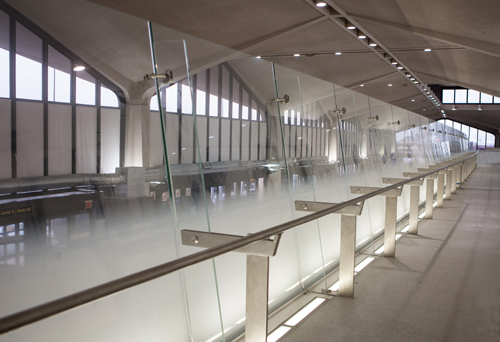 Bendheim supplied the decorative glass wall panels behind the ticket counters.